After fighting for its independence from a colonial power, America found its foreign policy, and therefore its place in the world, with the Monroe Doctrine. Until the Monroe Doctrine was proclaimed, America had chosen to stay clear of the power struggles between the nations of Europe with what amounted to an isolationist foreign policy. Content in not involving itself with European struggles, America focused its efforts on its own part of the globe. It used the occasion of Spain’s military incursions to suppress rebellion in Latin America to set the stage of keeping Europe out of the Western Hemisphere. On December 2, 1823, in his seventh address to Congress, President James Monroe made clear a new foreign policy that would later become known as the Monroe Doctrine. It has been the cornerstone of American foreign policy in the Western Hemisphere ever since. What the Monroe Doctrine essentially established was a moat around America and warned the European colonial powers to stay out. 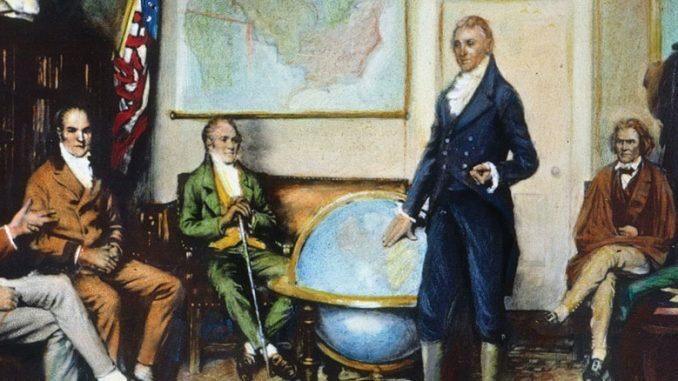 President Monroe declared any European power that “extended their system to any portion of this hemisphere as dangerous to our peace and safety.” What is remarkable about the Monroe Doctrine is not only did it declare the areas immediately bordering the country as its sphere of influence, but it grandly claimed the whole hemisphere as her sphere of influence. In the beginning the address was met with disregard and skepticism. Prince Metternich of Austria was angered by the statement, privately writing that it was a “new act of revolt” by the United States and would give “new strength to the apostles of sedition and reanimate the courage of every conspirator.” Britain, having positioned itself against the Holy Alliance which was trying re-establish Bourbon rule in Spain and therefore the colonies in South America, however, indicated it would help enforce the Monroe Doctrine with the Royal Navy. And Latin America with its emancipation movement leaders—Bolívar, Santander, Rivadavia, and Victoria—reacted favorably to the doctrine though with an eye on the fact America did not have a military strong enough to easily enforce its new foreign policy stance. Even up to the 1880’s America’s navy was smaller than those of Argentina, Brazil, and Chile. Slowly, the interpretation of the Monroe Doctrine was broadened by American presidents. In 1845 President James Polk used the principals of the doctrine to incorporate Texas into the Union. He justified his action by expressing fear that an independent Texas as a nation might become an ally to a European power, and therefore become, by proxy, a European threat to the United States. By the beginning of the twentieth century America had grown into an industrial power with a strong military and was the supreme power in the Western Hemisphere. Teddy Roosevelt’s further broadened the interpretation of the Monroe Doctrine to include what he called a “corollary” interpreting a more interventionist role. He proclaimed in December of 1904 that because “…in the Western Hemisphere the adherence of the United States to the Monroe Doctrine may force the United States, however reluctantly, in flagrant cases of such wrong-doing or impotence, to the exercise of an international police power.” He used this interpretation of the Monroe Doctrine to justify both his former and future actions in Santo Domingo, Nicaragua, Haiti, Panama, and Cuba. The Monroe Doctrine was a turning point in the history of American foreign policy and how it viewed its role in the world. To understand America’s approach to foreign policy, one cannot go without studying the Monroe Doctrine. It is impossible that the allied powers should extend their political system to any portion of either continent without endangering our peace and happiness; nor can anyone believe that our southern brethren, if left to themselves, would adopt it of their own accord. It is equally impossible, therefore, that we should behold such interposition in any form with indifference. If we look to the comparative strength and resources of Spain and those new Governments, and their distance from each other, it must be obvious that she can never subdue them. It is still the true policy of the United States to leave the parties to themselves, in hope that other powers will pursue the same course….